Following up on a recent unveiling ceremony in Hannibal, Missouri, the U.S. Mint has shared its first images of the upcoming 2016 Mark Twain Commemorative Gold and Silver Coins. 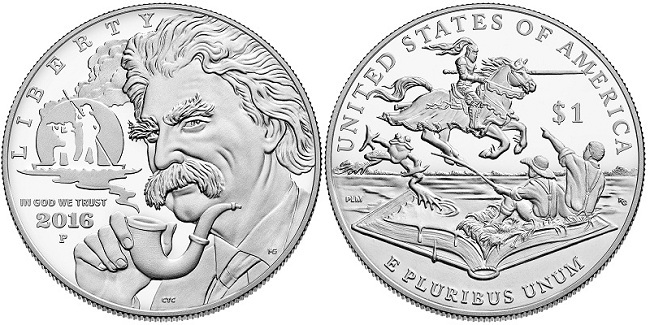 Images of the Proof version of the Twain silver dollar can be seen above; the Uncirculated issue is pictured below. The obverse of the silver dollar was designed by Chris Costello and sculpted by Michael Gaudioso. It bears a portrait of Mark Twain smoking a pipe; the smoke rises to form a silhouette of Huck Finn and Jim rafting the Mississippi River, as depicted in The Adventures of Huckleberry Finn. Inscribed along the left side of the design are LIBERTY, IN GOD WE TRUST, and 2016. The Philadelphia Mint’s “P” mint mark is also included in the field below the date. The Proof version of the Twain gold coin can be seen above, and the Uncirculated issue is pictured below. The gold obverse was designed by Benjamin Sowards, sculpted by Don Everhart, and includes a portrait of Twain with the inscriptions, IN GOD WE TRUST, LIBERTY, and 2016. The West Point Mint’s “W” mink mark is also included in the field below the date. The reverse was designed by Ronald D. Sanders and sculpted by Joseph Menna. A Mississippi River Steamboat is pictured, with the inscriptions UNITED STATES OF AMERICA, E PLUIRBUS UNUM, and the coin’s $5 denomination. As noted on Mint News Blog, the gold coin will weigh 8.359 grams with a composition of 90% gold and 10% alloy, and the silver issue will weigh 26.73 grams with a composition of 90% silver and 10% copper. Pricing and release dates for the coins will be released sometime next year. I (think) I am surprised that the honoree’s name (Mark Twain) is not on any of these coins (?). Or maybe that’s the way it always is (?). Z. Barolo, I did not notice that Mark Twain’s name (or Samuel Clemens, for that matter) was not on either commemorative — very astute observation on your part. Or maybe it was an oversight by the designers and the person(s) who selected the final designs. The silver coin design is fabulous, it does capture the work of Mark very nicely. I think the name not being there is a blessing in two way – it acknowledges the wide appeal and awareness of Twain with the masses , two – it leaves that much more space to show other important things. The designers should be very proud of end product. I agree, Mahesh, the two coins are very well done in how the subject matters are presented. The $5 coin emphasizes the single design element on each side in a literal straightforward way, and makes good use of the blank space. On the $1 coin, the design components take up practically all the space, as if one is peering into the writer’s mind and the reader’s imagination.. Both commems are terrific, and in my opinion, showcases the essences of Mark Twain and his enduring legacy, in two different creative styles. I haven’t bought commems in quite some time, but I may buy both these Twain coins next year. Mr. Two Cents: Thanks for addressing my comment & adding information (re: the Washington commemorative). Nice that some in the community of coin collectors are ready, willing & able to help and share information with others. Mahesh: I agree with what you say – not much (or any) space on the Ag coin for anything more. Maybe on the rim? On the Au coin I think they could have included the name. But in general my philosophy on coin design is “Less is More”.